This poem, by the renowned Emily Dickinson, perfectly defines that fickle emotion, capable of giving flight to the soul like no other. 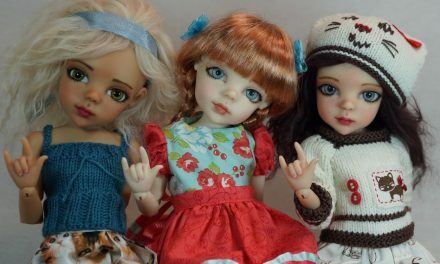 Dollmaker and fashion designer Connie Lowe of Marbled Halls interprets that emotion in doll form with DOLLS’ new exclusive, “Hope.” Lowe was inspired to create “Hope” by recent life events. “To me, hope is to dream with expectation of realizing those dreams. When I was diagnosed with cancer, I had hope. I did not want to accept anything less than realizing that hope,” Lowe said. “Hope” is the latest release in Lowe’s lovable and adorable Sprockets line. 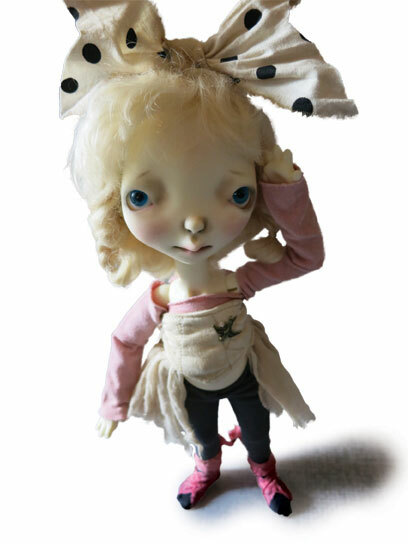 She is a resin ball-jointed doll (BJD) and limited to an edition of 100. “‘Hope’ represents the dream to achieve. I wanted this Sprocket to be special, to inspire others to dream, to hope, and to achieve,” Lowe said. “I think her expression shows that hint of insecurity, with a slight smile showing determination and the strength to never give up.” The little bird attached to her shirt perches on her “soul and heart” with a constant song. “Hope” comes completely dressed in a tattered ballerina ensemble, with leggings, slippers, shirt, tutu, bird, and oversized polka-dotted bow. “Her tattered ballerina costume reflects back to my beginnings in the BJD world,” Lowe said. “My first costume release was a series called The Tattered Ballerina. The ensembles represented the beauty to be found in something less than perfect. “I think ‘Hope’ will be well-received by collectors because she represents something we all need — the ability to dream and to hold on to that dream, to hope,” Lowe said. PreviousGraduation Extravaganza: Valedictorians, future superstars, and bizarre figures earn high marks. 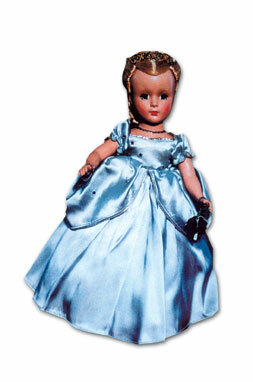 NextPretty as a Princess: If Kate’s baby is a girl, expect a kingdom’s worth of dolls to follow!